Some time ago, I installed LinuxMint 10 LXDE on my EeePC 901 but never did a lot with it since then. Well, now I've done just a little including installing Conky, getting both Conky and Compiz+Emerald to start at boot and removing the transparency from the LXTerminal which, because of the default settings, was such as to make the terminal almost unreadable. 1. Getting Conky to run involved no more than installing conky from Synaptic, installing conkyforecast and conkyemail, copying .conkyrc and .conkyForecast.config from my Ubuntu install on the same machine to the home directory in LinuxMint. Additionally, I copied conkyip from the ~/scripts directory in Ubuntu to a similar subdirectory in Mint. However, I had initially forgotten to copy over the conkyip script which meant that the External IP didn't work and for which I got an error when I tried to launch Conky from a terminal. But, even though Conky appeared to have started, it didn't show up on the Desktop. Only when I commented out the External IP line in .conkyrc did Conky finally appear. Here's a link to somebody else who had the same weird experience. 2. Getting apps to start at boot is not quite as straightforward in Mint as it is in Ubuntu. In LinuxMint, you must manually add the commands for the apps, preceded by @, to the file /etc/xdg/lxsession/Mint/autostart. To get compiz and emerald to launch at boot, I had to create a script containing the above command and add this to the autostart file. Similarly, I scripted the Conky launch as I wanted to include a 10 second sleep befopre launch as this seems to avoid some unwanted behaviour. 3. 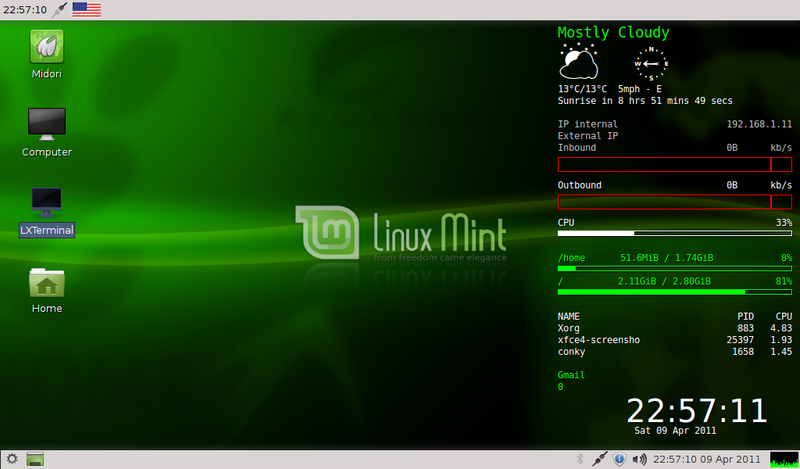 Without compiz, the LXTerminal in LinuxMint was quite usable. But, once I had launched compiz, the terminal background became completely transparent making readability difficult. However, this is easily resolved by going, on the terminal, to Edit>>Preferences>>Style>>Background and clicking on the color bar for the Background color. Now you can change the color if required but, primarily, you can slide the Opacity slider to a higher level.